Work in Progress / @Plaza: Play in your computer! Ever wanted to walk around and frolick in a 3D world that is your PC? @Plaza will enable you to play within your own computer 3D world!. 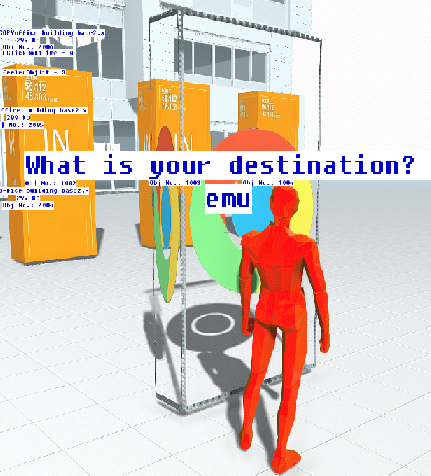 Walk around in a virtual environment, where you can walk around and interact with elements in your computer. 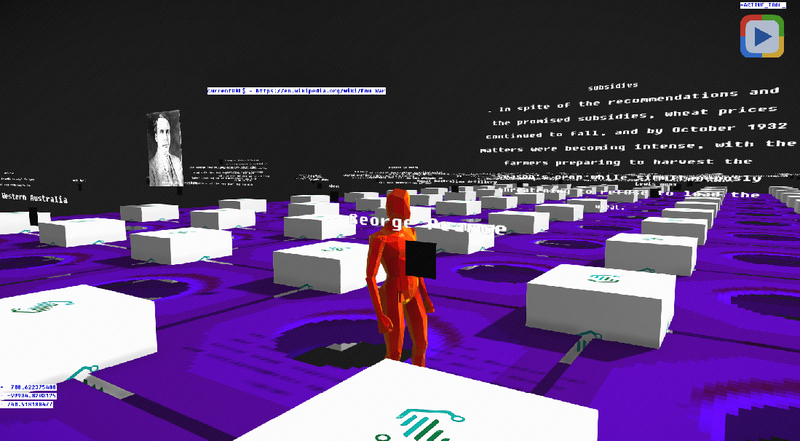 The game will construct a 'digital world' composed of the files and folders you have on your hard drive. Explore your hard drive in 3D world! 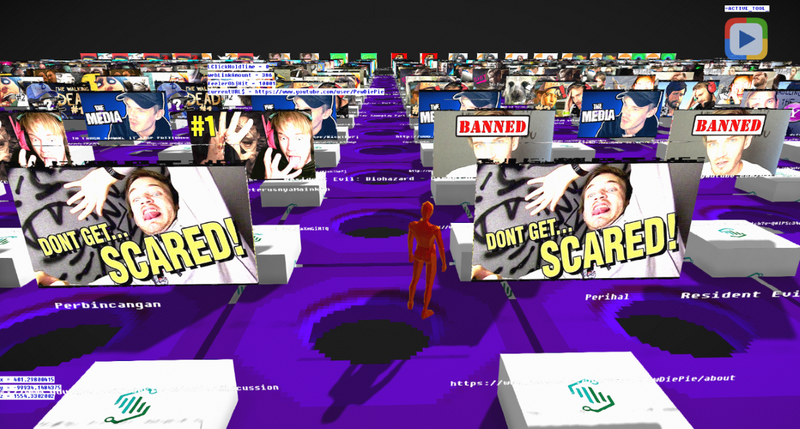 Explore the Internet in 3D world! You can then interacts with the files and folders, use them to build an environment where you can relax with your friends. Build your own plaza from the contents from inside your computer! Have your own 3D models of a city? Walk and find them in the game, and use them to create another city of your own! Had a bunch of pictures that you never know what to do with? Make a gallery out of them, and let your friends visit! Had a collection of music that nobody else would hear? Play them in a mini-concert, with your own animated 3D models as the band! Feeling adventurous? Fight computer viruses! Feeling chatty? Chat away with friends in their world! Bored of your own world? Visit a friend's world instead! Don't feel like doing anything? Just walk along, mess around with your files! - Copy-paste and move files in your computer and the real files in your hard drive will be modified too! - NPC - To serve different purposes - Guards, shopkeepers, even advertisement carrier! - Model manipulator - Use your own 3D models to customize your own plaza! If you want to mess around with the unfinished version, download it from the attachment. CAUTION: You will need to disable your firewall and antivirus temporarily, as the nature of the game which explores your files will be detected as malicious behaviour. - ESCAPE key to open menu, free mouse, and can close the game from there. Nice idea; keep at it. This would be a cool way to interact with people online for presentations or casual events. I wanted to make a 3D operating system a number of years ago, but went with working on my video game instead. Good to see someone working on something along similar lines of what I imagined. Thanks, that's a swell idea. Imagine a professor waiting in his plaza, then students came in, and he teaches using videos and images as slideshows. The students then can ask questions via chat lines. Although seriously, please make a 3D OS. VR is blooming, 3D OS in VR would be phenomenal. What you mentioned about slideshows is actually happening in the Minecraft community; some teachers use it to present their illustrations. I am not sure if I will get the chance to make the 3D OS, it will be a while before I complete my current project. But sure, it is a great time to make one with VR and AR in the limelight. It was not just about making it 3D, but making it practical; which would have been an interesting challenge. Looking forward to seeing your project progress. Do the "folder floors" scale when you have a whole heap of files in a single folder? And how are sub-folders realized? Furthermore is there some kind of colour coding by file type for the boxes? And does the view adjust if you have a much larger (taller then I suppose?) file in a folder? Quote: "Do the "folder floors" scale when you have a whole heap of files in a single folder?" The 'field' with home icons are nothing but just a matrix. The 'distribution' of the folders scales with total directory size though, in way that it prevents the folders from distributed too sparsely or too tightly, based on total directory size. But we can scale the floors to, if such need arises in the future. Quote: "And how are sub-folders realized?" The subfolders and the files inside the folders will 'sprout' once you 'walk' on their respective parent folders. They are arranged within the confines of X and Z dimension of their parents folders. Quote: "Furthermore is there some kind of colour coding by file type for the boxes?" Quote: " And does the view adjust if you have a much larger (taller then I suppose?) file in a folder?" The subfolders and files are arranged 'on' their parent folders, and not 'in' their parent folders. So you sort of like 'walk' on the folders, and the files/folders it contain will 'sprout' on that folder. IF you 'play' the videos or images, the images/videos always appears on top of the file objects, rotating to face you. You can adjust the camera view with the mouse scroller. The default camera is 3rd person camera controlled by the mouse. But if you prefer 1st person then we can zoom in till it became 1st person. Quote: " Just wouldn't want to accidentally drop a file en-route to another folder (does that delete it?) or accidentally delete something"
Hohoho don't worry about that. To interact with files, you'll need to hold the left mouseclick for a small amount of time until the gauge reach 100%, so you'll have time to cancel the wrong action before it actually take place. You will need to change the active tool to a specific tool from the menu. Each tool has a specific function (preview, copy, delete, ect). The more 'dangerous' a tool is, the longer you will need to fill the 'action' gauge, to prevent mistakes. For now I only made the 'copy' tool, no 'move' or 'delete' yet, but those will be made as they are 'must-have' tools. So don't worry about mistakenly deleting files for the time being. For now I just intended this to be a leisure game though, just for fun. Too bad I can't do this in VR because DBPro stucks with DirectX9 (thats why I need your DX11 badly haha). 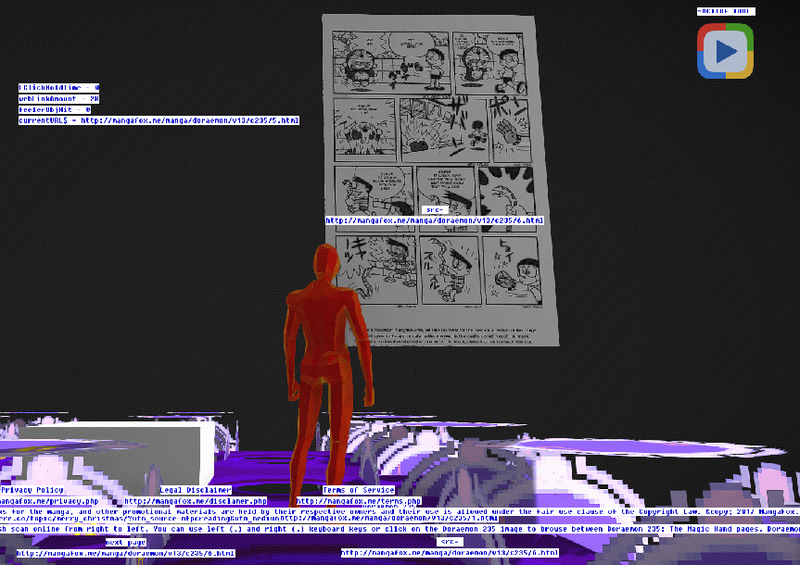 Now you can preview 3D models! They resizes themselves so they won't be too large or too small. And they rotates to give you the overall looks. - Abandoned the old walking algorithm. That walking sequence was really smooth, and had inverse kinetic too, but there's several problem with it. Using it, the collision shapes was limited to boxes only. This means you can't have proper collision with complex objects. Not to mention there's a lot of calculation going on, so it affect speed too. - So now, you can jump as high as you want! Set up a tower, and jump up to on top of it! 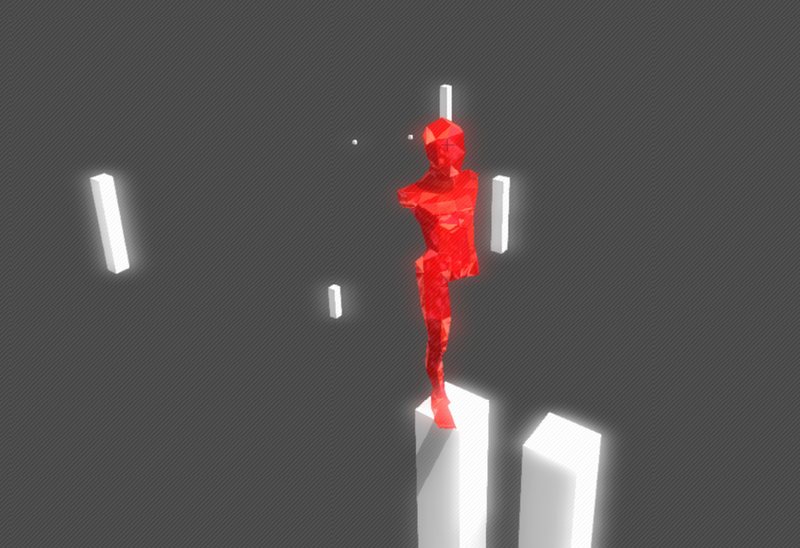 - Using combined limb manipulations and object animation for object animation instead. Now we can have proper collision with complex object. What this entail is, we can walk around in the game world, find a 3D model file lying around, and turn that file into an object scene to build the world in-game. With proper objects, we can create a whole city with it. Cool character movement system you got there. I notice you got a little bit of a post rendering shader in the screenshot there. Hey Chris Tate, thanks! Unfortunately, I think I'll abandon that walking system. I'll use the simpler modified animated method for now. But might come back to it later. Thanks to Ortu and Green Gandalf, I set up Advanced Lighting. Adjusted it so not the whole shebang of lighting is visible. Still need to optimize performance though. Still researching on best way for multiplayer thingies. Will proceed with the core stuff when I can find another stretch of time. Now we can destroy files, with shards-explosion effect! And the game autosaves, so your custom plaza/city files arrangements and your copied files will be saved/loaded automatically. Keep up the good work; loving the quality of character animation. Changed my 'file explorer' game exploring system. Now, instead of of 'walking' on folder to explore its content, you can 'go inside' each folder, which is represented by a room. The files in it will be in the room. Now, at least, we will at least got the sense of 'going inside' a folder, instead of files sprouting beneath out feet. Also, now we don't have to define a initial directory. The game just make doors for every HDD that we have, and we'll explore the HDD from there. I see you got the file icons to load into the engine; that's pretty cool. Are you going to attempt to provide web page browsing in 3D? It would be a cool alternative way to read. Quote: "I see you got the file icons to load into the engine; that's pretty cool. Are you going to attempt to provide web page browsing in 3D? It would be a cool alternative way to read." Err actually those things in the middle of the screen are just icons for tools that we can select, such as play tool, copy tool, delete tool, ect. Sorry to disappoint. Files and folders dont have the icons that they had in windows explorer. The orange doors are the doors to folders room. Files are in those rooms. Red doors takes us back to previous parent folder that current folder/room is in. Web thingies are probably way over my head. Is there any preexisting starting guide to browse websites in DBPro? Quote: "Is there any preexisting starting guide to browse websites in DBPro?" You could use BlueGUI for this or just the gui2_web.dll (A.K.A. CWEBPAGE.dll). BlueGui looks very useful for GUI. Thanks. How would I go about to retrieve texts and pictures from websites, using DBPro HTTP commands? Or should I use some plugins for that? Attached is a zip file of the BlueGUI WebBrowser Demo. Type or paste your link into the text box and press go. With DBPro's HTTP commands you'll need to parse the html source and build the page in code. I see, BlueGui can open up a browser. Is there a list of commands for gui2_web.dll? So, there is no way to obtain infos from a website using DBPro, so they can be represented by 3D objects? Blue-GUI uses gui2_web.dll to support these functions. I'm not sure which of the Blue-GUI generic windows functions will have an affect on the web gadget. I remember once seeing a demo somewhere on this forum that displayed a cube textured with a webpage using Blue-GUI. Trying to work that out now. No, that's not the one. But, if DBPro can display a webpage there are ways to get a texture from it. First attempt failed, really didn't think it would be that easy. I wonder if we can return the website texts by using AppGameKit? I have tried every DBPro and Blue-GUI native function to capture the html document to a texture with no luck. Time to break out the DirectX and GDI API functions. If you think you can manage something using GetHTTPFile, here is the same function in DBPro, minus the PostData. External DLL might be a key to this, as you said. Thank you for pulling the scales off my eyes. I found a nice list of commands for Urlmon.dll. I'll go through them slowly later. Is there other DLLs that we can use to pull datas from websites? Here is a list of dll's used by Microsoft Internet Explorer. This is the exported functions of urlmon.dll alone using Microsoft's Visual C++ utility - DumpBin. Copyright (C) Microsoft Corp 1992-94. All rights reserved. Anybody knew what happened to DBPro command? It really makes 3D text objects? Why can't I see it in our current DBPro command list? Or is there any known plugins for making 3D texts? For website textures I would look into extracting the image of a web browser control into a texture. There are many ways to skin that cat but it requires getting into DLLs and plugins. As for 3D text, this handy snippet by Jukuma allows you to make 3D text, amongst other interesting shapes. print "Press a mouse button ..."
For the past one and a half month I've been doing nothing but worked 14 hours per day, with no progress at all on this project, and need to continue doing so for another 2 month. I have had a few 'bad' months myself so can understand the frustration. Gotta keep the focus on the aspects of the work you enjoy the most to stay motivated. Awesome work. Your visual style is on point. Keep up the coding man! The more you do, the bigger app gets, the greater the self emerging ideas and the more popular the product becomes. Also, If you had no luck turning a website into a texture; you might want consider using a seperate executable as a shell command to produce the required texture for you to load from file. You can turn a website into a texture using Windows, by turning the window into an image and then loading that image. If you cannot turn a window into an image using the API's or plugins WickedX mentioned; then I guess the last resort is for me to create you an dotNet 4.0 executable which can do the job in the background, since you cannot call a dotNET DLL directly without creating a DBPRO wrapper plugin. The only major flaw in this technique is that the Internet Explorer control is used which is not really supported by Microsoft anymore because of the introduction of Microsoft Edge; so the behavior of the control may be unpredictable on new machines and future versions of HTML. Worst still, the default browser version for the control is Internet Explorer 6.0; you have to override the default version for the control by overriding the user's web browser control's Internet Explorer version in their system registry, which requires a bit of work. Thanks for the encouragement. I think the previous method to get stuff from websites is able to fill my need, as I don't really planned any bombastic features. But currently I just randomly do little things here and there. I'm supposed to be posted at an area that I'm not keen to go, so I'm waiting for my application for relocation to be approved. So I'm not sure how much time I'll actually have. So I kind of afraid to go into big things yet that requires long stretch of time. 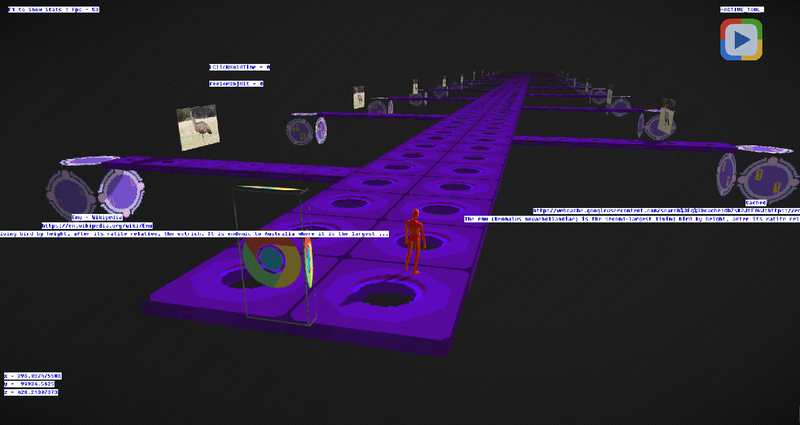 Working on 'internet exploration' feature. Now we can explore the interweb itself! Currently we can specify what we are looking for, and the portal will take us to a 'internet highway' that will branch to related websites, similar to Google search. From this highway, we can see numerous roads that branched into websites related to 'emu'. Walk to the roads, and we can read the decription and images related to those websites. The road that leads to portal that will take us to a website. You can see the related image, URl, and description of the website. Currently working on those portals that will take us to explore the websites. Now we can visit websites! The flow is Plaza --> search --> highway with roads to websites --> websites. We can interact with portals to follow the links on websites, and it will take us there. Still need to design better stages, improving parser, and enable the player to grab elements from websites to be brought back to plaza. With this, the player will not be constrained by their own computer anymore. Probably will design sort of dungeon for the player to explore later, with viruses as enemies. That's a really cool idea to build something like that, I'm not aware anything similar currently exists. I guess that it could be combined with VR and other tech to build a immersive and weird experience. Quote: " I'm not aware anything similar currently exists. I guess that it could be combined with VR and other tech to build a immersive and weird experience." JanusVR lets you explore internet in 3D world, even with VR. But to my understanding, normal websites are only viewed on 2D planes, and only websites with special JanusVR codes will be presented as 3D world. 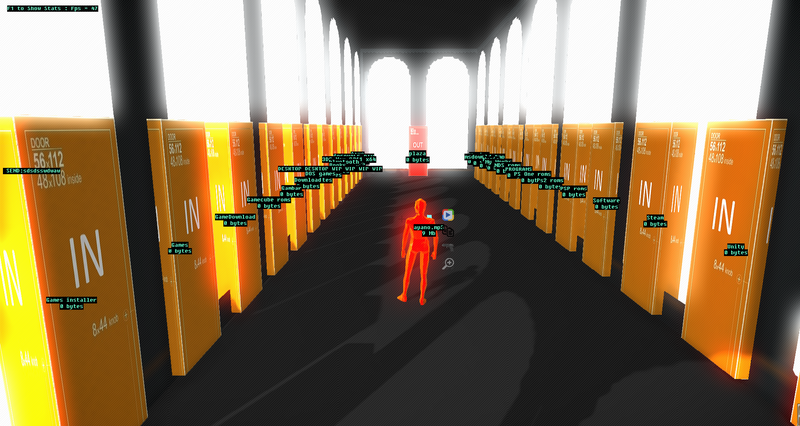 VIRUS: The Game lets you kill virtual viruses in the hard drives. You have demonstrated a lot of creativity and consistency in your work on this project, and hope the pressures of life does not distract you from taking this all the way into the software market. Nice work. I think it would be quite interesting to be able to interact on social media using a 3D world. How do we login into websites using DBPro command? And how do we make DBPro 'remember' that we already logged in? I mean, how do we know what to POST or GET using this function? Supposing we have the HTML source for a webpage, is there a line in the source somewhere telling us what to use? Quote: "Return String=HTTP REQUEST DATA(Verb, Object, String To Send)"
Quote: "Generally, the website in question will provide an api which will tell you that information if they intend their site to integrate with external sites and apps"
For example, if we're on www.google.com, there will be a space to input our search strings. 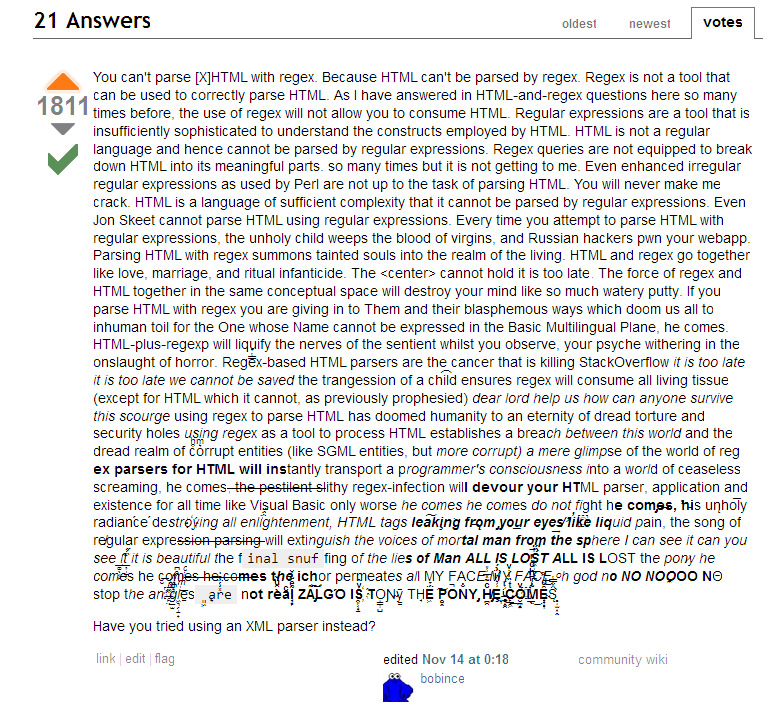 My question is, is there anywhere on the HTML source that represent and tell us what to GET/POST? String to Send = ???? 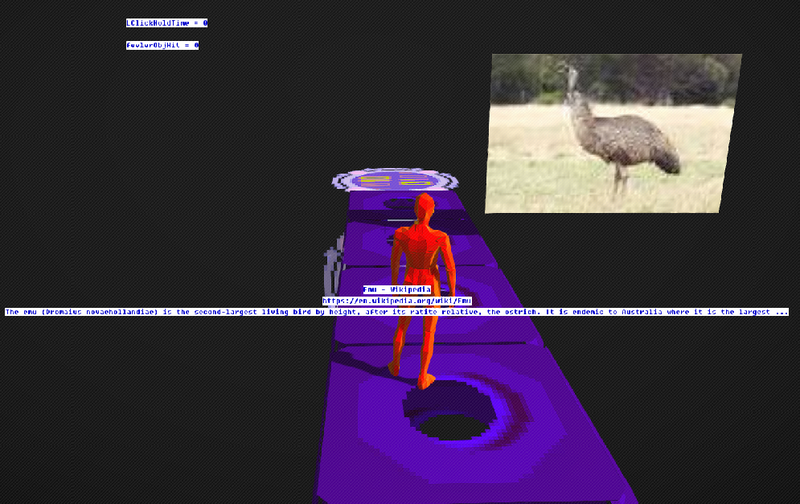 Supposing we want to search for "Emu" on www.google.com page, then how do we know what 'String to Send' should be like, just by looking at HTML source? Because it seems like there some kind of formatting to it. Is the proper formatting for 'String to Send' recorded somewhere in the HTML source? How do we know what 'object' and 'string to send' are, just by looking at HTML source of www.google.com? Is there a tag or something that marks the possibility for user input? The problem is that web pages are not designed or intended to be used this way. Instead, some sites, like Google, Facebook etc provide an api: a programming interface for other developers to use thier services and systems, much like functions in a third party library, in an external app or site. Sorry for turning this into web crash-course, but it's really educational. If each websites have different API, how do normal browsers knows what APIs to use for each different websites it visits? normal browsers dont need to use an API, they load and execute the site directly. One thing you may look at it in firefox or chrome, open the dev tools (F12) go to the network tab, and you can see what requests and with what values are being made as you navigate and use a website. Quote: "How do we know what 'object' and 'string to send' are, just by looking at HTML source of www.google.com? Is there a tag or something that marks the possibility for user input?" IF you are fortunate, you will find a <form> element in the HTML source which contains all the input fields you can use for submission. The tricky part is getting DBP to submit the form; I have no idea how to do this in DBPro. In a webbrowser control you would trigger the submit function of the form element; without a browser control I do not know how you can submit the forum using raw HTTP coding.